WASHINGTON -- Corey Oswalt had a VIP scouting him in high school in San Diego before the 2012 draft. Paul DePodesta, who lives in the area, personally checked out Oswalt a few times before the Mets used their seventh-round pick on the right-hander, which ended up trumping a college baseball offer from UC Santa Barbara. The 6-foot-4 Oswalt, now 20, is 4-1 with a 2.68 ERA in eight appearances (seven starts) for the Brooklyn Cyclones this season. He has a solid 1.008 WHIP, with eight walks and no homers surrendered in 43 2/3 innings. “I just feel healthy now,” said Oswalt, who lost much of last summer because of surgery to repair a torn meniscus. “Last year I was battling some injuries. It’s everything I expected so far. Oswalt actually committed to UC Santa Barbara primarily as a shortstop and third baseman, positions he played in high school the other two games a week when he wasn’t pitching. He hit over .500 as a sophomore and junior, although he noted he was not much of a power hitter. “I just hit for average,” he said. His senior year of high school, the team had quite a pitching tandem. Left-handed pitcher Ian Clarkin was selected last year by the Yankees with the 33rd overall pick in the draft. DePodesta wasn’t the only high-profile San Diegan visiting Oswalt in high school. Although Oswalt eventually committed to UC Santa Barbara, San Diego State coach Tony Gwynn had visited practices trying to recruit him. Oswalt, a Padres fan, was stung like many by his recent death. Oswalt trains in the offseason at a facility with Tony Gwynn Jr. as well as ex-Met Aaron Harang and a handful of Padres players, so he had a personal relationship with the family. Oswalt’s uncle Jeff Oswalt, a left-handed pitcher, once was selected by the Montreal Expos in the first round (15th overall) in 1986. He did not end up signing that time, played college ball, and ultimately never rose about rookie-level ball with the St. Louis Cardinals because of an injury. With Brooklyn, Oswalt throws a four-seam and two-seam fastball. He also has a slider and what he refers to as a circle or two-seam change. His four-seamer sits at 90-92 mph and tops out at 93 mph, although he throws the two-seamer 75 to 80 percent of the time. That pitch sits at 88-91 mph. Average: T.J. Rivera, Binghamton, .346; Matt Reynolds, Vegas, .344; Matt den Dekker, Vegas, .331; Dilson Herrera, Binghamton, .321; Enmanuel Zabala, GCL Mets, .315; John Mora, Brooklyn, .312; Wuilmer Becerra, Kingsport, .312; Jeff McNeil, St. Lucie, .305; Kevin Plawecki, Vegas, .304; Josh Satin, Vegas, .289. Homers: Brian Burgamy, Binghamton, 20; Dustin Lawley, Binghamton, 19; Andrew Brown, Vegas, 18; Allan Dykstra, Vegas, 15. RBIs: Allan Dykstra, Vegas, 67; Brian Burgamy, Binghamton, 66; L.J. Mazzilli, St. Lucie, 65; T.J. Rivera, Binghamton, 63; Dilson Herrera, Binghamton, 59. Steals: Patrick Biondi, Savannah, 23; Dilson Herrera, Binghamton, 22; Champ Stuart, Savannah, 21; Jeff McNeil, St. Lucie, 16; Darrell Ceciliani, Binghamton, 15. ERA: Marcos Molina, Brooklyn, 1.27; Robert Gsellman, Savannah, 2.45; Steven Matz, Binghamton, 2.47; John Gant, Savannah, 2.68; Corey Oswalt, Brooklyn, 2.68; Kevin McGowan, St. Lucie, 2.97; Darin Gorski, Vegas, 3.33; Tyler Pill, Binghamton, 3.94; Ricky Knapp, Savannah, 4.08. Wins: Gabriel Ynoa, Binghamton, 10; John Gant, Savannah, 10; Robert Gsellman, Savannah, 9; Greg Peavey, Binghamton, 9; Logan Verrett, Vegas, 9. Saves: Chasen Bradford, Vegas, 14; Robert Coles, St. Lucie, 12; Akeel Morris, Savannah, 12; Cody Satterwhite, Binghamton, 11. Strikeouts: Noah Syndergaard, Vegas, 107; Steven Matz, Binghamton, 106; Darin Gorski, Vegas, 105; Tyler Pill, Binghamton, 104; John Gant, Savannah, 102. • In his last 10 games with Las Vegas, Matt den Dekker is hitting .436 (17-for-39) with eight walks and only five strikeouts. Den Dekker isn’t the only 51s player on fire at the plate. Infielder Matt Reynolds, a former second-round pick from the University of Arkansas, is the reigning Pacific Coast League Player of the Week. In 43 games with Vegas, Reynolds is hitting .329 with three homers and 22 RBIs and has a .390 on-base percentage. He has multi-hit performances in seven of his past 10 games, including going 4-for-5 Sunday at Sacramento. • Right-hander Hansel Robles has been reassigned to the bullpen with Binghamton. Mets officials have witnessed an uptick in velocity since the conversion began with a July 19 relief appearance. In one recent game, Robles’ fastball sat at 93-95 mph. Robles, 23, had a 4.97 ERA in 17 starts with the B-Mets this season. • Omar Quintanilla, who last played with Vegas on July 11, is done for the season. Quintanilla has a meniscus tear. • The Mets do not plan to name their Arizona Fall League contingent until late this month, but former first-round picks Brandon Nimmo and Gavin Cecchini are candidates to participate. Recently drafted Michael Conforto is not a consideration. 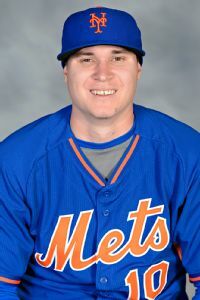 • Left-handed reliever Jack Leathersich finally earned a promotion from Binghamton to Las Vegas on Monday after going 3-3 with a 2.93 ERA in 37 relief appearances with the B-Mets. Leathersich struck out 79 and walked 21 in 46 innings in the Eastern League. Lefties actually hit .254 against him, while righties hit .200. Leathersich had control issues late last season after a promotion to Triple-A. The former fifth-round pick out of UMass-Lowell walked 29 in 29 Pacific Coast League innings in 2013. • Right-hander John Gant has earned his second South Atlantic League Pitcher of the Week Award. Gant, who turned 22 on Wednesday, had a perfect-game bid through 6 2/3 innings on Sunday to improve to 10-5 with a 2.55 ERA in 19 starts for Savannah this season. • Like Matt Clark a few weeks earlier, 26-year-old infielder Rylan Sandoval requested and was granted his release. Sandoval would not have played much with Binghamton after Wilfredo Tovar rejoined the club following thumb ligament surgery. Sandoval, a 30th-round pick by the Mets in 2007, was hitting .262 with one homer and 12 RBIs in 107 at-bats with the B-Mets. • Left-hander Darin Gorski, who was quietly putting up a solid season, has a fractured foot that will end his season. • Ismael Tijerina looks like he is making a successful transition from light-hitting infielder to right-handed reliever. Tijerina, 24, is 4-for-4 in save chances and has a 2.03 ERA in 11 appearances with Kingsport this season. Tijerina hit .214 in 84 at-bats last season in Brooklyn. He twice was used out of the bullpen in Cyclones games in 2013 when the team ran out of pitchers and exceeded 90 mph with his fastball.